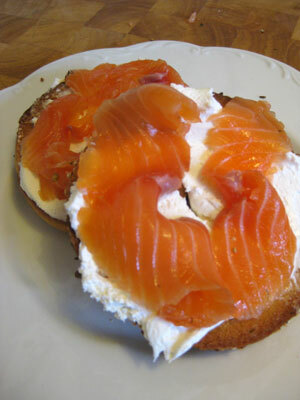 I HEART BACON – Seattle & LA-based food blog with recipes, restaurant reviews and all things bacon. For dessert number three, I found a tea & chocolate recipe in my Sous-Vide Cuisine cookbook. I vacuum sealed a pound of chopped milk chocolate with White Sage & Wild Mint Tea and placed in the water bath for 2 hours to meld. 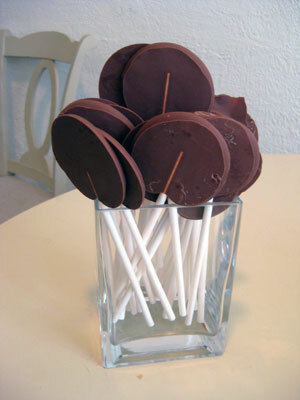 Afterwards, I strained the chocolate, poured into blobs on waxed paper, added a lollipop stick, sandwiched with another sheet of waxed paper and squashed them flat with a heavy atlas. People went nuts for these. My brother called it the “drug course” because they were so laden with caffeine that everyone was buzzing and giddy. Most people had two. A few even considered having three. Recipe here. Dessert number one was a huge hit and a crazy sugar blast. I made a quick mousse by whipping heavy cream with raspberry jam and spooned it over donut crumbles (glazed donuts pulsed a few seconds in a food processor then toasted until very crunchy). The “molecular” portion of this course was an effervescent lime sugar, which was a sugar syrup with lime zest heated to a soft candy stage and mixed with fizzy. As soon as the fizzy was added the liquid went crazy and started to foam and harden. I quickly spread it onto a silpat to let it cool, then crumbled the resulting candy into chunks. While it was really cool to make, it tasted a little like lime alka seltzer and I decided to leave it off the dessert. Of all the recipes I researched for this party the arugula “spaghetti” sounded like the most fun to make. 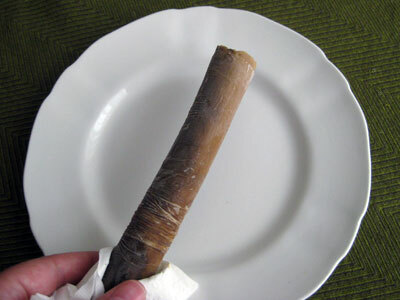 The arugula was pureed with water and agar agar and sucked into a tube with the aid of a syringe. The tube was then put into an ice bath to firm up. 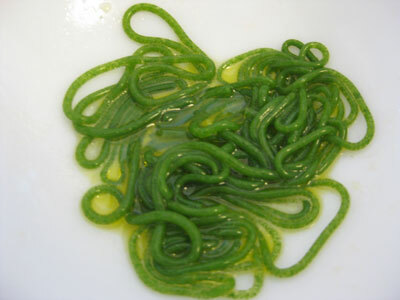 Once firm, the syringe was depressed and out shot the most beautiful, brilliant green “spaghetti” (video here). I wanted to test out my new sous vide machine and make duck confit. Long story short, the machine broke and I had eight duck legs sitting in tepid water overnight. Not good. Amazon to the rescue… I actually bought canned duck confit online (Rougie Confit of Duck Legs, 4 legs, 53oz) and it turned out to be the best confit I’ve ever had! The spaghetti honestly didn’t taste like much, but guests loved the rich, silken duck meat; even those who didn’t like duck were converts. 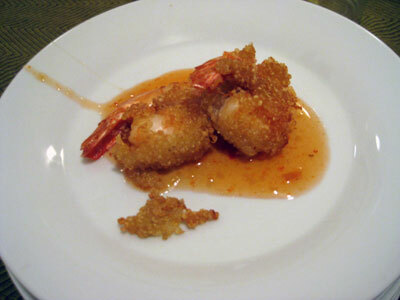 For the fish course I found a recipe for quinoa-coated shrimp in A Day at El Bulli. The quinoa was mixed with a solution called metil, but it was difficult to coat each individual shrimp and get the quinoa to stick. It was even harder to fry them without losing the coating entirely, but it was worth the effort. The shrimp were crisp and crunchy and delicious dipped in sweet chili sauce. Next up was a “greens” course. 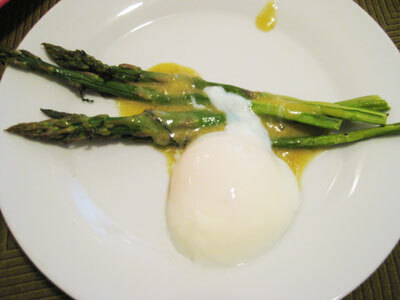 I wanted to make the asparagus with the soft poached egg recipe from Momofuku , but with a lemon-based sauce. For the eggs I used my broken sous vide machine to monitor the water temperature and perform water circulation, but had to use a burner on low with an improvised heat diffuser made out of tinfoil for the heat. With this setup I could keep the eggs at 145° F for 50 minutes to soft-poach them in their shells. I brought out a platter of asparagus roasted with olive oil and julienned mint and bowl of what looked like raw eggs and had everyone plate their own dish. I got some confused looks from guests wondering about the eggs, and loved the surprised and gleeful looks when they cracked them open to find a perfectly poached egg. Kind of like performing a magic trick. The final addition was a lemon & mustard emulsion (see recipe below) that used xantana for a thickener. 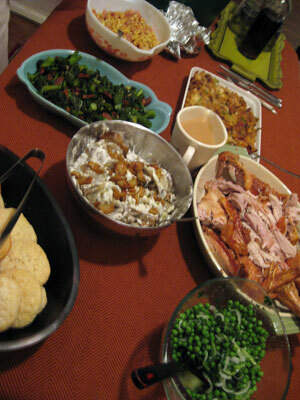 It was a gorgeous, viscous sauce that had body and a great savory lemon flavor. This might have been my favorite dish of the night and I would definitely make it again. Some of the fire happy people finished off their eggs a bit more with the blow torch. Add all ingredients to a bowl and whisk vigorously, or use an immersion blender. Will keep several days in the fridge.